What do you get when you cross golf with soccer? Footgolf! If you've never tried it... It's a kick... literally. 18 footgolf holes are intergrated into the back nine of Silver Oak golf course. We offer unique character that traditionally flat courses don't have. Footgolf mirrors golf in the rules and how it's played. 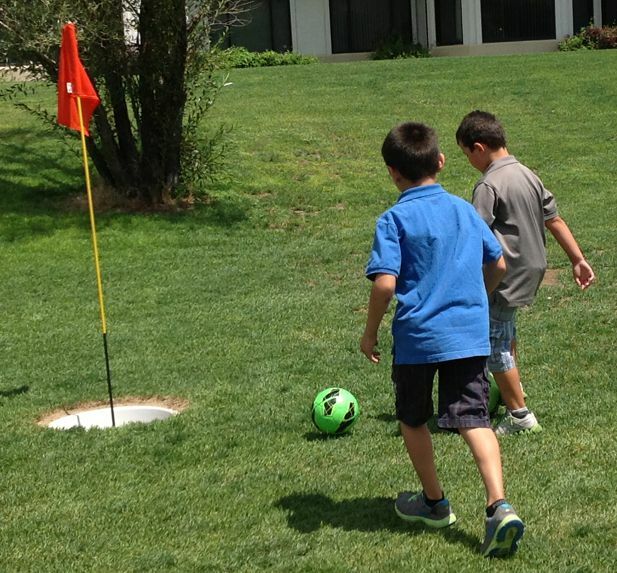 In footgolf you use your foot to kick a soccer ball into a 21" diameter cup. Footgolf tee times subject to availibility! Q: What type of shoes do i use? A: Appropriate footwear is required. Indoor soccer shoes, tennis shoes, etc. No spikes or cleats of any kind please. A: Although a traditional outfit includes; shorts, knee high argyle socks, collared golf shirt and "driver" style cap... it is not required. Dress as if you were going to play at the park. We simply ask no swimwear, tank tops or cut-off jeans. Q: Do I need my own soccer ball? A: You're more than welcome to bring your own ball. We have soccer balls to use at no-charge. We require a $5 deposit, which you get back once the ball is returned.